My partner and I have decided to go a different route and switch over to something more fun… video games. For a while now my partner has wanted to change what we were writing about but I liked the subject of gun control so we continued to write about it. After the few blog posts we have written, it has become apparent that it is hard to write about gun control. Both of us like video games and it is a lot more fun to talk about so now this blog will be focused on video games. To start off the new blog I want to give a shout out to my favorite game called Skyrim. If you are a fantasy nerd like me you will love this game. I feel it has all the aspects of a great fantasy RPG like magic, an immersive story, ad of course the lore. I would highly recommend this game and the other games made by Bethesda like the Fallout series. All these are the most popular addictive games in the world… It’s not just for steam. 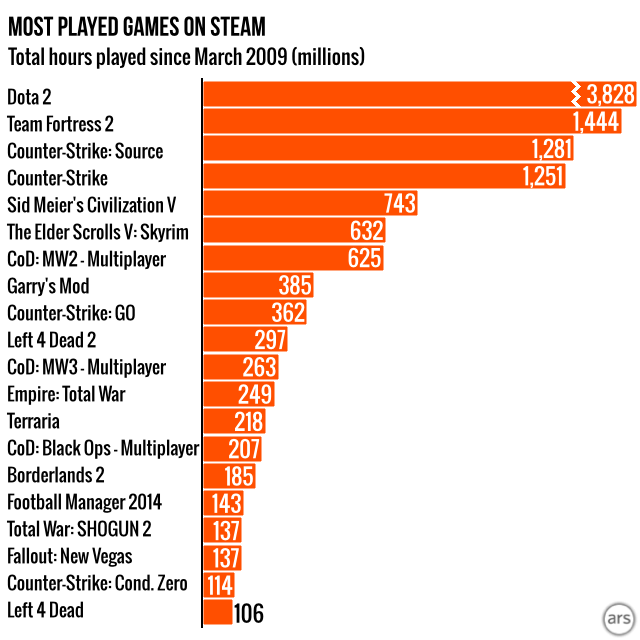 You can see that Skyrim is 6th most popular game. Here is a picture for the game. Looks pretty addicting right?! I was reading up on new laws and regulations on gun control and a happened upon Donald Trumps site for his policies. I was reading through and scrolled down to the section on the second amendment which really made me happy. The first thing i see is “Defend the Second Amendment of our Constitution. The right of the people to keep and bear Arms shall not be infringed upon. Period”. That how it should be, these laws and regulations only hurt law abiding citizens. One of the other policies on the page was “Empower law-abiding gun owners to defend themselves. Law enforcement does a tremendous job, but they can’t be everywhere all of the time” which supports my argument. You can look at gun control as basically the government taking away the right to defend ones self and that shouldn’t be left unacknowledged. Another way to think of guns that most people don’t think of is this. People should stop making excuses on things they understand in a different way. New gun laws have already been passed! The most recent one is that it is required to register with the Government to buy ammunition. On top of that you have to pay a fine to register. I have been studying early america and when stupid taxes are being placed on basically everyday items it is bound to result in resistance. For example the Whiskey rebellion, the government placed a tax on whiskey, all back-country farmers were making it. They got pissed of at the tax and rebelled against it. It is like cornering an animal the closer you get, the more of a threat you are to the animal. Once you get to close it lases out at you. That is what is going to happen if guns keep getting restricted at the rate they are. That’s why it would be so easy for criminals to mess with people with guns. Seriously, it’s true… What is the difference between the people and government. We are all people after all, they get guns, we get guns, they don’t, we don’t. I still don’t understand how the heck would a law like this help in being more safe. Have you noticed that everything on the news about guns are only absolutely horrible stories of people being shot? Well it is complete bogus. Sure there are some incidents where people are shot but what about the stories when guns actually save peoples lives. There are hundreds of stories where guns save people’s lives. The news just feeds people biased information that twists their views on things. It is ridiculous, story after story of people getting shot. No wonder the view towards guns is so twisted. Give people the whole truth not an interpretation on the truth, Guns help people and should be restricted as harshly as it has been. there are two ways to think of this guy, either way if he was protecting himself or trying kill someone. How do you know? You can’t just judge people for what they look like or do because what if that person was trying to protects himself or his family, or what if that this person was threatened to kill someone or his family will get killed which is pretty common. Guns can be used for both, killing and protecting but it would be more for protection because killing would be easy without a protector if you think about it. Lets start off the post with my thoughts on one of the new gun laws. First of all the featureless weapons law. This law makes absolutely no sense to me. How does making the gun featureless prevent someone from inflicting the same amount of damage as a regular weapon. The government just wants to inch it’s way to banning guns all together. What then people? The laws are only hurting the law abiding citizen. 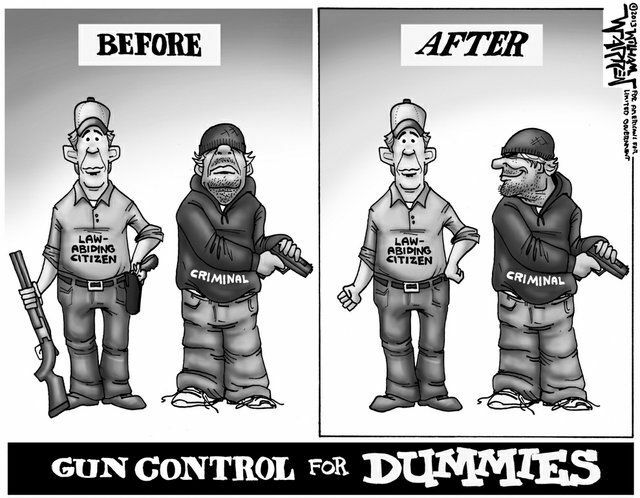 Criminals wont obey the laws, they wont give up their guns. The law abiding citizen will; if the laws keep inhibiting guns we wont have a tool to defend ourselves. Gun_control_blog will write mostly about gun control laws and history. Betterhealth435 will write about some funny stuff pertaining to gun control.